Occasionally spins in a circle while breathing fire. Beautiful and useful, but (alas) Not a Mobility: Air (flies) pet. While it doesn't have a heal compaired to many dragons it does have 2 defensive moves(Lift Off and Rake). It has a useful middle ground by casting Flyby and using Quills until the enemy sets a trap which can be evaded by Lift Off. Or, if verses magic you can do extra damage by stacking Flyby and Spamming Flame Breath. The S/S breed is fast, it has an attack that takes advantage of its speed, it has a damage debuff, and because it's so quick Liftoff let's it avoid a Waterspout/Geiser/etc. Very handy pet! 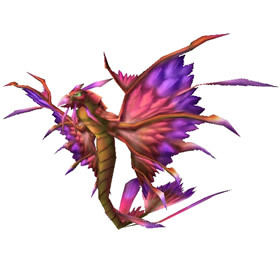 Drops from Al'ar in Tempest Keep, comes in three breeds. S/S with 325 speed, H/B with 1546 health and S/B wich seems to be worse off. Quills require speed otherwise go with Claw. Lift-Off will be useful to evade whichever breed you got but of course more useful with speed. Flyby or Rake depending on if you feel you need some small defense or more damage output. Can be really nice when dragonkin racial kicks in. Not very often seen in action though. Al'ar dropped one for me today, and S/S version too, and he's already a rare so WOOT. Off to level the little pretty. Cant wait to see how he holds up in a battle. How does he do in battle? I haven't gotten around to leveling mine and I'm trying to round out the dragon trifecta. Got the Ahes of Alar mount last week and this guy this week running it solo...My luck is holding! Got this guy for 300g, yes 300, on the AH. Got mine today first run, second week of TK. Boss is farily easy to solo as long as u stay close to him first phase and jump down before he respawns on the second phase to avoid fire damage. Cute little guy, got him in my first run. Just got this little guy. Seems pretty cool ready to start leveling him. The fight was pretty easy once I realized I had my Direbrew Beer Stein equipped. These brightly-colored dragonhawks carry Kael'thas' forces swiftly and unerringly through the nether storm surrounding the Eye.